Concern Grows For Loujain Al-Hathloul, Jailed Saudi Women's Driving Activist Loujain al-Hathloul, who opposed the kingdom's past ban on women driving, is among several Saudi female activists who have been imprisoned since last year. Relatives say the women have been tortured. Friends of Loujain al-Hathloul made a photo to parody a Vogue Arabia cover image showing a Saudi princess in a red convertible. Pictured here (left to right) are Ayendri Ishani Ridell, Urooba Jamal, Narissa Diwan, Atiya Jaffar and Rauza Khan. Hathloul "took a huge risk to advance women's rights in her country," Jamal says, "and now is facing the most heinous injustices." In 2014, a 25-year-old Saudi woman, Loujain al-Hathloul, got behind the wheel of a car and drove from the United Arab Emirates into Saudi Arabia. She took a video in which she's shown wearing sunglasses, a headscarf and a huge smile. For women, driving was banned in the ultra-conservative Saudi kingdom, and Hathloul's road trip landed her in jail for more than two months. Despite her arrest, Hathloul, who had a driver's license from the UAE, continued to battle for Saudi women's right to drive. But her efforts took a more grave turn last March, when she was arrested in the UAE, says Adam Coogle, a Middle East researcher with Human Rights Watch. "She was ... pulled over while she was driving and apparently taken and put on a plane to Riyadh in very murky circumstances," he says. She was briefly detained in Riyadh before being released. Then, Coogle says, in May, just before Saudi Arabia lifted a ban on female drivers last June 24, Hathloul was "picked up again in the larger crackdown against the women's rights movement." Coogle says between 10 and 12 women, including academics and journalists, were swept up in that crackdown. Saudi authorities still haven't clarified why the women, most of whom remain in prison to this day, were arrested. "When they arrested them, they accused them publicly of treason and ran a smear campaign against them," he says. "In fact, the women have not actually been presented with any charge." Urooba Jamal, 26, a friend of Hathloul's since they were students at the University of British Columbia in Vancouver, says it's clear the Saudi authorities do not like independent activism as a way of prompting change in the kingdom. "I think that Saudi Arabia has felt threatened by the activists and their positions, and I think they're trying to teach them a lesson," she says. Jamal is part of a Vancouver-based group called Friends of Loujain, calling for the release of Hathloul and the other jailed Saudi female activists. "I felt compelled to join Friends of Loujain simply as someone who knew her, and someone who has watched her over the years grow in her activism," she says. Hathloul is "someone who took a huge risk to advance women's rights in her country and now is facing the most heinous injustices," she says. Jamal and human rights activists believe Hathloul was arrested because Saudi Crown Prince Mohammed bin Salman, the country's de facto leader, did not want anyone else but him to claim credit for the end of the driving ban. Jamal was outraged when Vogue Arabia dedicated a special edition in June 2018 to the changes in the kingdom under the crown prince. There was no mention of Hathloul or other driving activists, and the glossy cover, touting the "trailblazing women of Saudi Arabia," featured a photo of a Saudi princess behind the wheel of a red convertible. 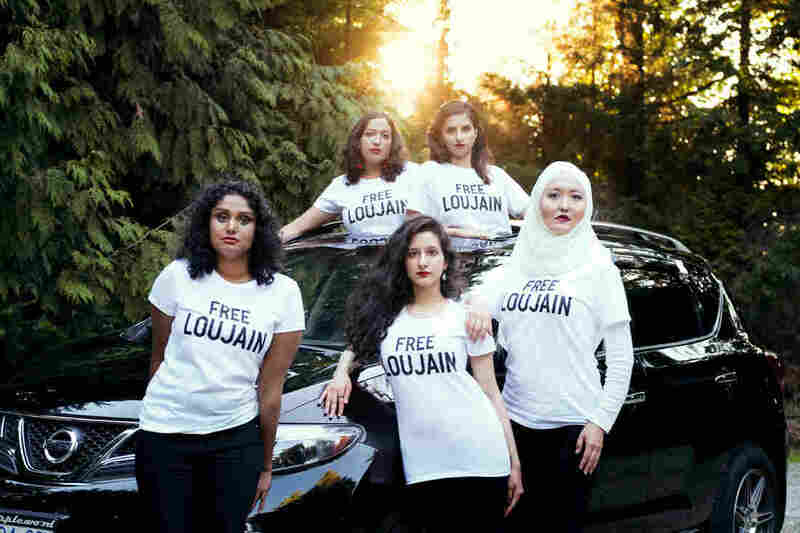 The Friends of Loujain group parodied that image with a photo of a woman driver wearing a "Free Loujain" t-shirt. A separate photo, showing five women wearing t-shirts calling for freedom for her and four other jailed activists, was published in September in Teen Vogue, along with an op-ed by Jamal and other group members. The women write that these activists are "the real trailblazers behind the overturned [driving] ban" and demand their release. Rauza Khan, a friend of Loujain al-Hathloul, wears a "Free Loujain" shirt while posing for a photo that parodies an image on the June 2018 cover of Vogue Arabia. The parody photo was made by the Friends of Loujain group. The following month, Saudi journalist Jamal Khashoggi was killed at the Saudi consulate in Istanbul. U.S. intelligence agencies have made an assessment that the crown prince was involved in Khashoggi's death. Jamal says Khashoggi's killing raised awareness of Hathloul's situation. "There was suddenly a lot of worldwide attention, not just to Khashoggi's case, but also Saudi Arabia's human rights record," she says. "A lot of people were suddenly talking about the detained activists as well." In November, Amnesty International and Human Rights Watch issued reports about mistreatment of the female activists in prison. Coogle says the rights groups' allegations were firmed up by Hathloul's sister Alia, who wrote a Jan. 13 op-ed for the New York Times in which "she revealed that Loujain had told her parents that she had suffered brutal torture, including beatings, waterboarding, whippings, as well as electric shocks. Her parents ... noticed that she was trembling and she couldn't sit or stand properly," Coogle says. In a Jan. 31 op-ed for CNN, Hathloul's brother Walid wrote that his sister described being taken at midnight to "a 'palace of terror' that is 10 minutes away from the prison. She said she was taken blindfolded and thrown into the trunk of a car on the way to this secret place. The torture sessions, she said, normally occur in the basement of this palace." On a visit last week to Washington, D.C., Saudi foreign minister Adel al-Jubeir said Saudi authorities were looking into allegations of mistreatment. He defended the women's incarceration and accused them of being a threat to national security. "There were funds received from foreign governments that were hostile," he told reporters. "There were ... attempts to recruit individuals in sensitive positions and to take sensitive information and pass it on to hostile entities outside Saudi Arabia. So there's more to it than meets the eye." Jubeir said evidence about the female activists would come up at trials. "I would say wait until the trials take place and the evidence will come out," he said. "Those who are not implicated will be declared innocent and those who are guilty will be punished." Now, 10 months after their arrests, there's growing pressure — from Western governments, human rights groups, and the U.S. and U.K. press — on Saudi Arabia to release the jailed female activists. Last month, an impassioned Twitter thread about Hathloul and her husband, comic Fahad Albutairi, went viral. Kirk Rudell, a writer and producer in Los Angeles, met them on the set of the TBS show American Dad! in 2017, after he'd hired Albutairi for a small part. Rudell recalls they were a dynamic and charismatic young couple. "Without trying to own a room, they owned the room in the most in the most lovely, gracious, likeable way," he tells NPR. Rudell says Hathloul and Albutairi were hopeful about the changes in Saudi Arabia under Crown Prince Mohammed bin Salman. He knew that Hathloul had been arrested in the past, but thought she and her husband were safe because they were so well known. He began to worry in early January, when he saw that Albutairi's Twitter account disappeared, and Hathloul's went dormant. That's when he discovered she was in prison and her husband was keeping quiet. Rudell says he feels a profound sense of sadness and anger because when he met the couple, they told him they were excited about creative projects they were going to work on. He was stunned and gratified his tweet captured worldwide attention, including from celebrities including Sarah Silverman, high-profile journalists such as Jake Tapper and Chris Hayes, and politicians including California Democrat Adam Schiff, chairman of the House Intelligence Committee. He says more needs to be done to ensure Hathloul and the others are released from Saudi prison. "They were not advocating for overthrow," he says. "They love ... their country, they just wanted to be able to live in it a little more equally."